Don't let Delta Spirit singer Matt Vasquez's bikini tee shirt fool you, this is some serious business. We've followed the band closely since 2006 and have seen them close to a dozen times (never, ever a let down). 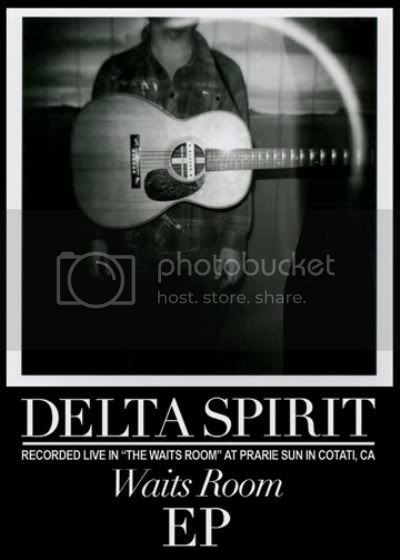 We are confident in again, naming the Delta Spirit to the illustrious Best Live Bands in America list. 2010 has seen the release of not one but two new albums from the band. The first, a full-length record named, History from Below, is another series of stories about people and places. Here the band plays to its strengths: telling stories by setting the table for listeners, while letting them finish for themselves. Tone, Pacing, Instrumentation, Emotion - they all feed into the songs and the live shows. It's interesting to think of the band as modern rock historians - the title of the album is play on words and an homage to recently deceased author and historian Howard Zinn - who Vasquez dedicates songs to from time-to-time during live sets. Like Zinn, Vasquez and Delta Spirit, helps audiences rationalize their place in time. And there is an element of escapism through the storytelling, even though the basis for the stories themselves are about the oft hard, difficulties - the unfairness of life. Some of these beautiful numbers seemingly tell audiences, "life can be unforgiving.. let's get on with it. Here is my story." This month, the band are on a series of shows which bring them here to Boston this Friday. They are toting a new album's worth of material. The Waits Room EP is on more of an experimental track. With the exception of one song, the album explores the lighter side of things. While a little melancholy, the songs here are clean, simple and true. This new collection of songs does two very important things for a band-about-town like Delta Spirit... It allowed them to flex their creative muscles (quality songwriting) while doing something fun and different, but at the same time - it allowed them to expand on the breadth of their live material and will let them "bring it down" with audiences. That level of intimacy, while not needed to be successful, was lacking in some of the bands more live, frenetic sets. In other words, the great just got better. Waits Room is only available online through digital download and on vinyl.